Nonsteroid Antiinflamation Drugs (NSAIDs) are available in drug store and be bought as a pain relief. Basic Health Research (Riskesdas) 2013 study the medicines stored in household. Basic Health Research (Riskesdas) 2013 was held in 33 provinces and 497 districts in Indonesia. The research encompasses 300.000 households in 12.000 blocks cencus. The participants were designated households and its member of the family. The study were interviewing the participants to obtain data of all drugs that are stored and used, including traditional medicines. The data including the brand, indication, the provenance (prescribed or unprescribed by doctor), the storage period and also observe drug condition. This study was further analysis of subset data in block IV of Riskesdas 2013 in households. The data were classified by its mechanism and its structure. 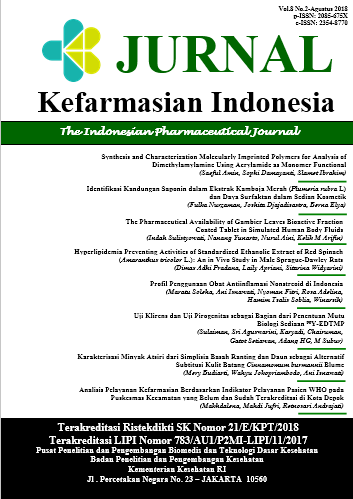 The result showed that East Java was the highest user of AINS drugs was (15%). Non selectif COX-2 drug and partial selectif COX-2 was 38,3% bought from drug store and 14,4% from drug store. For rheumatism treatment was all used for more than a month. Widely use of NSAIDs as a pain relief indicated the necessity of a proper medicine use information to avoid side effect of NSAID drug. 1. Kementerian Kesehatan Republik Indonesia. Laporan hasil Riset Kesehatan Dasar Indonesia (Riskesdas) tahun 2013. Badan Penelitian dan Pengembangan Kesehatan Kementerian Kesehatan RI. 2013. Jakarta. 2. Tjay TH, Rahardja K. Obat obat penting edisi ke 7. Gramedia Jakarta. ISBN 978602 02 64806. 2015. 3. Dixit M, Doan T, Kirschner R, Dixit N. Significant acute kidney Injury due to non-steroidal antiinflammatory drugs: inpatient setting. Pharmaceuticals. 2010; 3: 1279-85; doi.10.3390/ph 3041279. ISSN. 1424-8247. 4. Manurung KUS. Pola penggunaan obat dalam upaya pasien melakukan pengobatan sendiri di beberapa apotek. Skripsi. Universitas Sumatera Utara. 2010. 7. Supardi S, Susyanty AL. Penggunaan obat tradisional dalam upaya pengobatan sendiri di Indonesia (Analisis data Susenas tahun 2007). Buletin Penelitian Kesehatan. 2010;38(2):80-9. 10. Zarghi A, Arfaei S. Selective COX-2 inhibitor: a review of their structure activity relationship. Iran Journal of Pharmaceutical Research. 2011;10(4):55-83. 12. Almi DY. Hemetemesis melena at causa gastritis erosif dengan riwayat penggunaan obat NSAID pada pasien laki-laki lanjut usia. Medula. 2013; 1(1):72-9. 14. Lelo A, Rangkuti Z, Pane YS. Penggunaan anti-inflamasi non-steroid yang rasional pada penanggulangan nyeri rematik. Tugas akhir. 2004. Fakultas Kedokteran Universitas Sumatra Utara. 18. Herowati R. Obat dan suplemen untuk osteoarthritis. Pharmacy. 2013;11(1):40-8.